A Cultural Analysis of e-Learning for China. 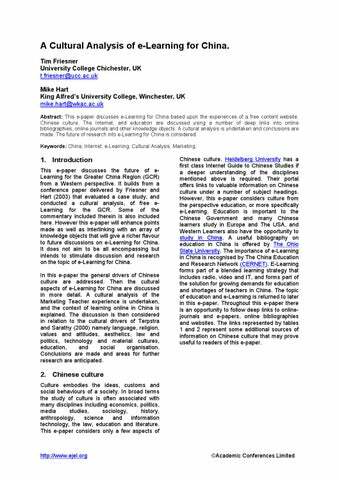 Tim Friesner University College Chichester, UK t.friesner@ucc.ac.uk Mike Hart King Alfredâ&#x20AC;&#x2122;s University College, Winchester, UK mike.hart@wkac.ac.uk Abstract: This e-paper discusses e-Learning for China based upon the experiences of a free content website. Chinese culture, The Internet, and education are discussed using a number of deep links into online bibliographies, online journals and other knowledge objects. A cultural analysis is undertaken and conclusions are made. The future of research into e-Learning for China is considered. Keywords: China, Internet, e-Learning, Cultural Analysis, Marketing. 1. Introduction This e-paper discusses the future of eLearning for the Greater China Region (GCR) from a Western perspective. It builds from a conference paper delivered by Friesner and Hart (2003) that evaluated a case study, and conducted a cultural analysis, of free eLearning for the GCR. Some of the commentary included therein is also included here. However this e-paper will enhance points made as well as interlinking with an array of knowledge objects that will give a richer flavour to future discussions on e-Learning for China. It does not aim to be all encompassing but intends to stimulate discussion and research on the topic of e-Learning for China. In this e-paper the general drivers of Chinese culture are addressed. Then the cultural aspects of e-Learning for China are discussed in more detail. A cultural analysis of the Marketing Teacher experience is undertaken, and the context of learning online in China is explained. The discussion is then considered in relation to the cultural drivers of Terpstra and Sarathy (2000) namely language, religion, values and attitudes, aesthetics, law and politics, technology and material cultures, education, and social organisation. Conclusions are made and areas for further research are anticipated. Chinese culture. Heidelberg University has a first class Internet Guide to Chinese Studies if a deeper understanding of the disciplines mentioned above is required. Their portal offers links to valuable information on Chinese culture under a number of subject headings. However, this e-paper considers culture from the perspective education, or more specifically e-Learning. Education is important to the Chinese Government and many Chinese learners study in Europe and The USA, and Western Learners also have the opportunity to study in China. A useful bibliography on education in China is offered by The Ohio State University. The importance of e-Learning in China is recognised by The China Education and Research Network (CERNET). E-Learning forms part of a blended learning strategy that includes radio, video and IT, and forms part of the solution for growing demands for education and shortages of teachers in China. The topic of education and e-Learning is returned to later in this e-paper. Throughout this e-paper there is an opportunity to follow deep links to onlinejournals and e-papers, online bibliographies and websites. The links represented by tables 1 and 2 represent some additional sources of information on Chinese culture that may prove useful to readers of this e-paper. 3. A cultural analysis of www.marketingteacher.com.cn The experience of creating and running a free e-Learning website for The GCR forms the basis of a case study. Marketingteacher.com was created in 2000. It is a website dedicated to marketing learners, teachers and professionals and states a clear mission ‘for marketing learners.’ The website contains over twenty short lessons on marketing topics including the marketing environment, strategy, tactics, and planning. Each lesson is supported with its own exercise and associated answer. Best of all for its 700,000 annual visitors (or 5,000,000 yearly hits) is that the website exploits the most powerful words in marketing, it’s free! Praise has been received from students, lecturers and practitioners from many Western nations. However, a strategy of adaptation is needed if the same free eLearning is to be marketed to Chinese learners. This section of this e-paper aims to answer the question, how can the underpinning idea of free e-Learning using the Marketing Teacher format be applied to nonWestern cultures? 83 commerce takes for granted. Credit card usage forms the basis of later discussion since Marketing Teacher does have a nonobligatory, chargeable online course. The latest survey on China's Internet development shows by 30 June, 2003, China had about 470,000 portals, with 68 million Internet users, and the numbers are growing every day (Financial Times 2003) . More information is available from The East Asian Collection at the University of Melbourne. The PRC is a country with a population in excess of one billion and the future opportunities for e-Learning are fantastic. A model was needed to analyse the issues of adaptation of the www.marketingteacher.com concept of free e-Learning to a Chinese context. The literature was reviewed relating to models and frameworks of business culture. The benefits of this approach are that there is an academically respected base of research that can be drawn upon to assist with cultural analysis. The business approach to cultural assessment does rely upon an accepted epistemology that links in with other areas of cultural knowledge. For example, antecedents such as values and beliefs, education, social hierarchy and many others have their basis in cultural studies. 5. Selection of appropriate cultural models There are a number of models and frameworks that could be used to analyse the culture of the People’s Republic of China (PRC) to give an indication of the appropriateness of e-Learning strategies. Some are very detailed whilst others are straight-forward. The models and frameworks initially considered included those of Hawkins et al (1992), Terpstra and Sarathy (2000), Hofstede (1984, 1994, 1996), and Wills et al (1991). This list is by no means conclusive but gives an indication of the breadth of models and framework in the literature. The models of Hawkins et al (1992) and Terpstra and Sarathy (2000) are similar and contain some common antecedents such as values, education and learning, social status and organisation. Hawkins et al (1992) approaches culture from a consumer lifestyle perspective whilst Terpstra and Sarathy (2000) consider culture in its wider contexts. This means that the Terpstra and Sarathy (2000) cultural framework is much simpler and easier to apply. For these reasons Terpstra and Sarathy’s framework was preferred and implemented over the model of Hawkins et al. organisations, technology and material culture, law and politics, aesthetics, language and religion. Figure 1: A cultural framework – Tersptra and Sarathy (2000). languages and linguistics of China can be found at the Chinese Language Teachers’ Association. 7. Religion Taoism, Confucianism and Buddhism are the main religions. Care should be taken to make sure that religious beliefs are not contravened. However there may be a benefit in recognising the behaviour of Chinese e-learners. For example, one respondent pointed out that by recognising a particular religious event or festival a website could earn favour and respect. There are a number of useful links to information on Chinese religions such as Taoism, Confucianism, Buddhism, Christianity in China, and Judaism in China. and Post-materialism are the three competing value orientations. The communist values see a selfless dedication to the well-being of society and mankind. The materialism values see the pursuit of immediate rewards and physical happiness. The post-materialism values see a way of life where the importance of material rewards is downplayed and there is an emphasis upon harmony between people and nature ( Inglehart, 1979). To understand the place of education in the GRC one need only to look at the expansion of education in the GCR and the increasing number of Chinese learners gaining Western qualifications. Whichever value the student subscribes to, education is highly regarded. means that website content could be copied or reproduced without permission. Censorship still exists if one wishes to publish an educational text in China. The Asian Law Centre links to resources on Chinese law and banking and finance, competition law, commercial law and e-commerce law, amongst many other legal areas. China has its own laws on e-commerce and e-transactions, privacy and information security that need to be considered especially if an e-Learning project is to collect information, collect fees or protect any intellectual property. Filtering is a problem for Western websites. Effectively the Chinese government censors websites by blocking access from China. The Chinese government maintains an active interest in preventing users from viewing certain web content. It has managed to configure overlapping nationwide systems to effectively block such content from users who do not regularly seek to circumvent such blocking. Such blocking systems are becoming more refined (Zittrain and Edelman 2003). Blocked sites tend to fall into one of a number of categories including democracy, health, news, government, religion, Taiwan, Tibet, entertainment and education. Indeed both the Western and GCR Marketing Teacher websites suffer from filtering. They share this disability with MIT and the Learning Channel as well as almost 700 sites list in Yahoo’s education directories (Zittrain and Edelman 2003). The Chinese government does not cooperate on the issue of filtering and this makes it difficult to accurately represent the extent of this problem. Until its extent is understood, strategies for overcoming the problem cannot work. This is a huge problem for providers of free or chargeable content. One could invest time and effort in created online materials and promoting their existence only to find that your site has been filtered and that no right of appeal exists. As technology develops apace there is a sources of very up-to-date information on China and technology. The Australian National University publishes a free online journal entitled ‘The Asian Studies WWW Monitor’ that covers a variety of related topics. Electronic Journal on e-Learning Volume 2 Issue 1 (February 2004) 81-88 higher and adult education. The educational system in China is described for the Chinese army in a summary displayed by The University of Maryland. Both of these sources support a wider dialogue about Chinese education. E-Learning is one aspect of blended learning and has its own series of issues that are evaluated as follows. A simple text translation into Mandarin has a series of problems. It should be appreciated that learning is an active process and teaching materials should be variegated (Liu, Lin and Wang 2002). The activity associated with online learning is seen as a clear advantage. It is the critical engagement with the World that ensures that learning takes place (Dewey 1916). The system of education in the PRC is demanding and often begins at a young age. Learning Putonghua demands a good deal of effort as well as time consuming rote learning. Chinese culture is collectivist and often depends upon informal chains of communication. Therefore open discussion albeit in forums or web casts could see an infringement of cultural values (Can 1999). Western educators need to be sympathetic to the successful teaching strategies used by Chinese teachers, and embed them into eLearning projects. Levy (2003) explains that most learning in China takes place in classrooms. Even where technology such as television or software is used it tends to be heavily instructor lead. for the Greater China Region. The challenges for free e-Learning are: a) The Greater China Region is made up of diverse cultures and this should be taken into account when creating web content for e-learners. b) Once an e-Learning website meets the needs of its patrons one can expect it to diffuse into use relatively quickly. c) The Chinese e-learner may feel that they are subservient to a teacher and this could prove problematic when no physical tutor exists. d) Indications show that direct word-forword translations are not adequate. e) Care should be taken to make sure that religious beliefs are not contravened. f) Whichever value the student subscribes to, education is highly regarded. g) Chinese branding and images need to be considered when constructing case studies or using examples. h) The PRC Government is still controlling. Copyright remains a huge grey area. This means that website content could be copied or reproduced without permission. i) You could invest time and effort in creating online materials and promoting their existence only to find that your website has been filtered and that no right of appeal exists. 15. Directions for future research. 87 governments or by public/private partnerships. There would need to be local Chinese representation and partnership in any venture. This forms the basis of potential research from a strategic point of view. From an operational perspective, the educational needs of individual Chinese e-learners would need to be addressed. There are a number of areas for further research including individual learning needs, preferred learning styles and the learning environment, lesson planning, the blend of learning and e-Learning methods. The applicability of Western learning taxonomies to Chinese learners and the balance pedagogical and andragogical would need to be considered in relation to Chinese culture. The usefulness of Western e-Learning strategies would have to be considered, for example video conferencing, forums, java based quizzes, and animation to name but a few. Finally the assessment and grading of Chinese e-learners against learning outcomes and assessment criteria would have to be addressed. ELearning for China will generate rewards to those that identify the needs of learners and then satisfy them with a tailor-made learning package. This e-paper opens the door on a discussion for e-Learning for China from a Western perspective. Electronic Journal on e-Learning Volume 2 Issue 1 (February 2004) 81-88 Usunier, J.C. (1996), Marketing Across Cultures, Prentice-Hall, Hemel Hempstead, pp. 78-79. 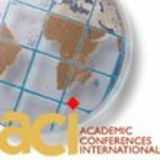 Wills, J.I., Samli, A.C. And Jacobs, L. (1991) Developing global products and marketing strategies; a construct and research agenda,’ Journal of the Academy of Marketing Science 19, (Winter) 1-10.